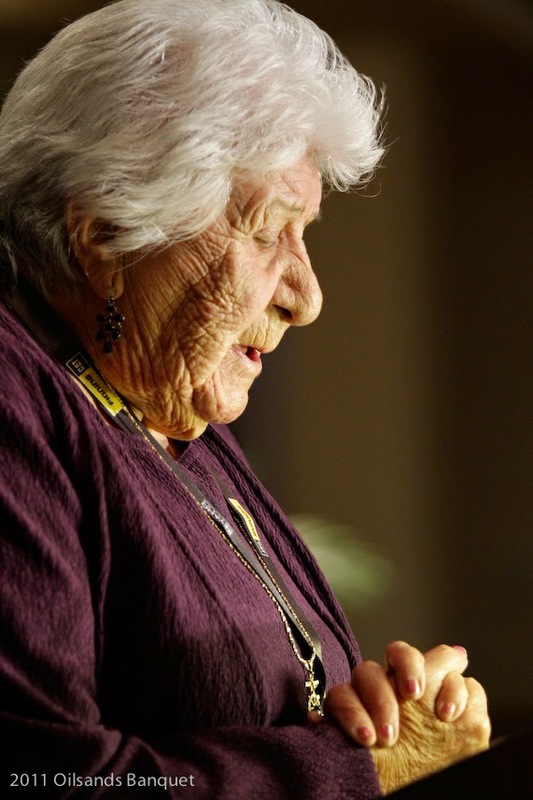 The mural I did of Elsie Yanik was inspired by a moment of prayer and reverence at the Oilsands Banquet in 2011, a photo captured by event photographer Joey Podlubny. I've heard amazing speeches by iconic industry and community leaders like Eric Newell, Steve Williams, Shawn Atleo and Jim Carter at the Oilsands Banquet. And I was able to hear inspiring stories from students, the year that CAREERS: The Next Generation was honoured. 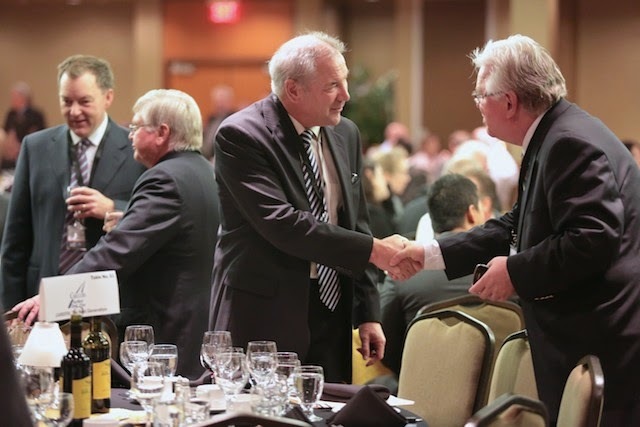 It was through the Oilsands Banquet, and the year they honoured Keyano College on the occasion of their 35th anniversary that I first met the dynamic organizer of this annual event, Phil Enarson (shaking hands with Steve Williams in the photo above from Oilsands Banquet VII). 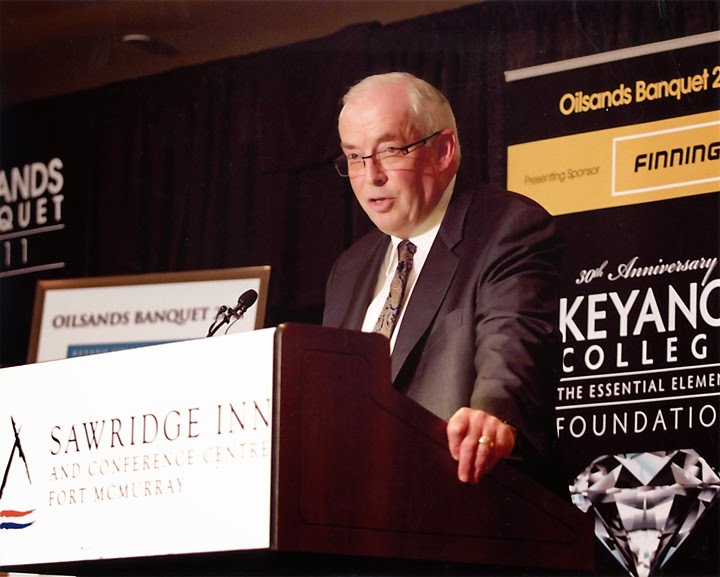 He and his team put on this experience that attracts business, industry, community and government leaders and shines a light on organizations that have been fundamental to our success and growth as a region: Oilsands Discovery Centre, Keyano College and their Foundation, Athabasca Tribal Council, CAREERS, and Regional Municipality of Wood Buffalo. 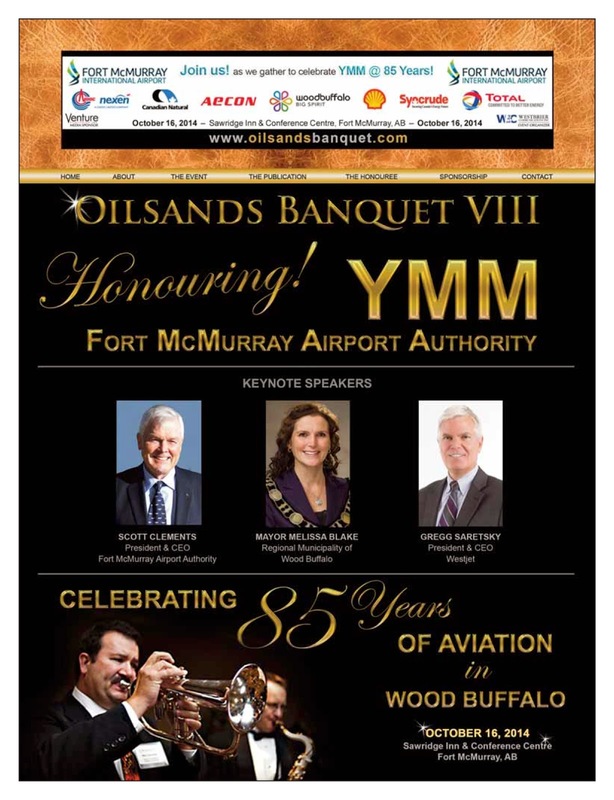 This year's event honours the Fort McMurray Airport Authority in a year that is not only significant because of the opening of the new terminal and the astronomical growth in air traffic in Wood Buffalo - leading the country in many categories - but because it also marks 85 years since aviation began shaping this area. 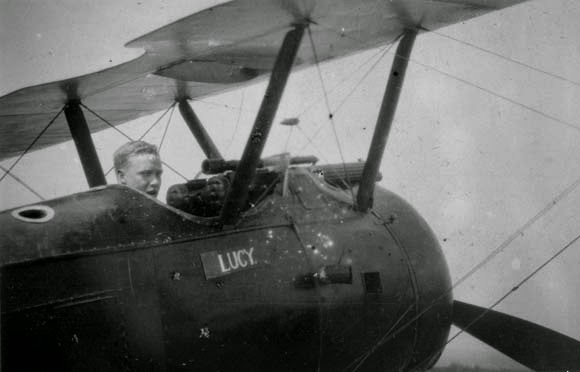 Punch Dickins and Wop May were some of the early pioneers of aviation in Wood Buffalo back in the late 1920s and early 1930s. They provided an essential service that delivered the mail, opened up the north, and often went above and beyond for families, as recalled by 96 year old Tom Morimoto. "The isolation of the north country in winter was finally ended by the arrival of travel by air," he shared. "The first commercial flights began in 1929 when Wop May's Commercial Airways began scheduled trips with mail to the far north." "I knew Wop and his wife Vi and used to play softball with them," he recalled. "I worked for Wop at Commercial Airways as an apprentice wireless operator - that was what radio was called in those days. I learned to become a morse code operator which helped me in being accepted into the Royal Canadian Corp of Signals during WWII." "I don't know that many people knew about the many kind acts that Wop performed. In my case, when my mother died in 1938, my brother Bob and I were in Yellowknife and he arranged for our flights by air to Fort McMurray to attend her funeral, even though we didn't have the fares. 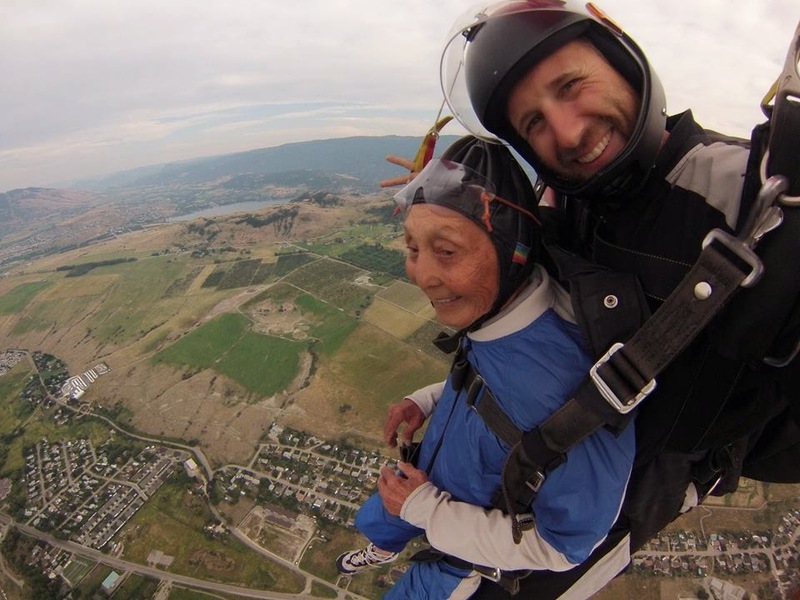 He let me paint the hangar to pay for my return fare to Yellowknife." The stories of the role of aviation are rich and colourful. Guests at the Oilsands Banquet will hear and see several of them. They will also get a sense of where things are now in the industry by Gregg Saretsky, CEO and President of Westjet. Scott Clements, President and CEO of the Fort McMurray Airport Authority, will look ahead, and cast a vision as to what is yet to come. I have enjoyed several of the Oilsands Banquets for the opportunities to network and have great conversations with many amazing leaders and innovators. "The success of any event is what happens when it is over," shared Phil Enarson a number of years ago. "What is the linger effect?" That idea has stayed with me and I have watched for how many stay around at the end of events that I've been involved with, so engrossed in conversation that they don't want to leave. The linger event at the Oilsands Banquet is pronounced, which contributes to its reputation of being one of the premier oil sands/Wood Buffalo networking events. It's also a very special night where people and organizations are honoured in a way that is exceptionally authentic and memorable.